Lucy's 51 posted a $10 for two cheeseburgers deal on Groupon, and Toluca Lake was on the way to the zoo. That was a double bonus for Happy Meal and myself. We found free parking on the street. We parked in front of The Counter, which was funny, because The Counter consistently served up over-priced, joyless burgers. I should have noted this as an omen. Upon walking into Lucy's 51, I was immediately surprised that they had posted a Groupon to lure diners in to have a burger. Lucy's 51 was a dimly lit lounge. So it goes. Happy Meal and I found a table and ordered a couple of cheeseburgers ($10.95). The wait was about 10 minutes. The Beef: The 8-ounce patty tasted was 100% Angus beef, and it was 100% Chuck. The burger patties were chewy/rubbery enough to suggest that they had arrived pre-formed and in a frozen state. While the burger was moderately beefy, it brought only one other flavor to the party. That flavor was char. The kitchen did get a nice flavor of backyard cookout char. The fat content was approaching 25%. As a result, the burger at Lucy's 51 was on the oily side. The burgers were cooked to Well-Done by default. Looking back, this was a blessing, since some of the excess fat had been rendered off. The Seasoning: The exterior of burger was dusted with an appropriate amount of savory seasoning blend. 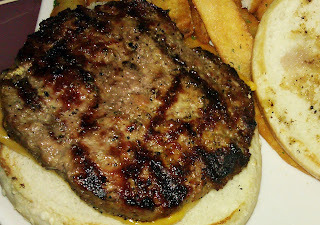 The Sear: The Sear on the burger at Lucy's 51 was merely OK. The burger patty was cooked on a gas-fired grill. It was turned 4 times to get some hash marks on the surface. The edges of the patty picked up some nice char and a little crispness. The Preparation: The burgers were cooked hard to Well-Done. 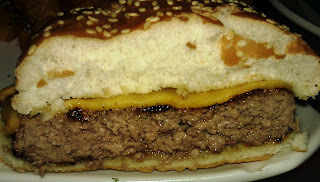 The moderately thick burger patties puffed up a little in the center due to the intense heat of the grill. This left the edges charred and the centers oily. The Cheese: The default cheese was a thin slice of a bland, Tillamook Cheddar. The Cheddar was unmelted, oily, rubbery, and completely uninteresting. The cheese brought nothing to the dish but additional fat. The Bun: The bun was fresh. It was a seeded, moderately sweet, standard, burger bun. The freshness of the bun did serve to partially compensate for the dry chewiness of the burger patty at Lucy's 51. The bun was untoasted, and this made sense due to the texture of the beef. The Toppings: The Romaine lettuce was fresh and crisp. The tomato slices were surprisingly ripe and flavorful. The Fries: The fries at Lucy's 51 were thick-cut, steak fries. The fries were cooked in fresh oil, and they were nicely crisped. 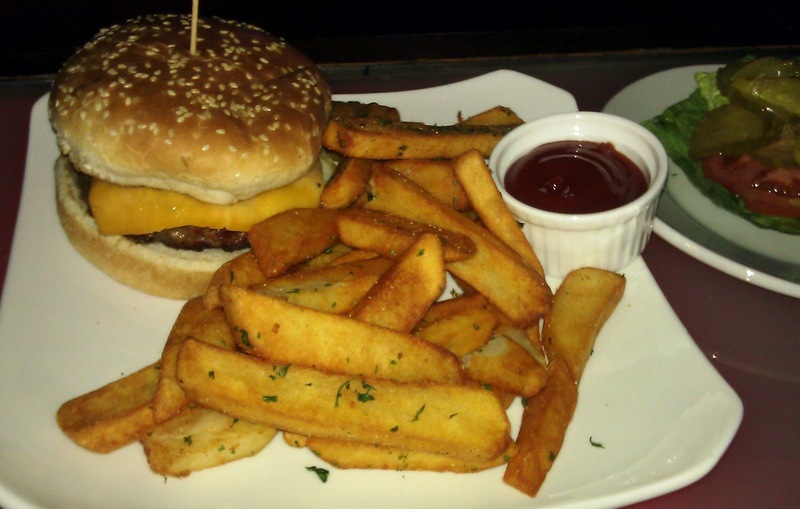 The thick fries were on the bland side, as they were seasoned with parsley rather than salt. There was no salt shaker at the table. The Value: $15, the $10 Groupon and a $5 tip, was a little more than I was happy with considering the meager quality of the meal and the dingy lounge setting. The non-Groupon price would have approached $30, and that would have been excessively spendy in consideration of the quality of the food. Overall, I was confused why Lucy's 51 promoted themselves with such a weak menu item. I was relieved that the establishment was on the way to my destination, and that I hadn't wasted a trip going out of my way for something so pedestrian. Burger Review : Lucy's 51 served up a completely average and somewhat over-priced burger....PASS.